The International Panel on Climate Change has identified coastal ecosystems as areas that will be disproportionally affected by climate change. Current sea-level rise projections range widely with 0.57 to 1.9 meters increase in mea sea level by 2100. The expected accelerated rate of sea-level rise through the 21st century will put many coastal ecosystems at risk, especially those in topographically low-gradient areas. We assessed marsh accretion and plant community state changes through 2100 at 12 tidal salt marshes around San Francisco Bay estuary with a sea-level rise response model. Detailed ground elevation, vegetation, and water level data were collected at all sites between 2008 and 2011 and used as model inputs. Sediment cores (taken by Callaway and others, 2012) at four sites around San Francisco Bay estuary were used to estimate accretion rates. A modification of the Callaway and others (1996) model, the Wetland Accretion Rate Model for Ecosystem Resilience (WARMER), was utilized to run sea-level rise response models for all sites. With a mean sea level rise of 1.24 m by 2100, WARMER projected that the vast majority, 95.8 percent (1,942 hectares), of marsh area in our study will lose marsh plant communities by 2100 and to transition to a relative elevation range consistent with mudflat habitat. Three marshes were projected to maintain marsh vegetation to 2100, but they only composed 4.2 percent (85 hectares) of the total marsh area surveyed. Takekawa, J.Y., Thorne, K.M., Buffington, K.J., Spragens, K.A., Swanson, K.M., Drexler J.Z., Schoellhamer, D.H., Overton, C.T., Casazza M.L. 2013. 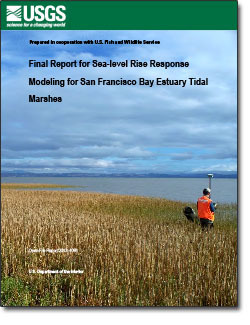 Final report for sea-level rise response modeling for San Francisco Bay estuary tidal marshes. U.S. Geological Survey Open File Report 2012- 1081, 161 p.